As I'm a lover of tea towels and hand blocked printing, I can't help but be a bit giddy when the two converge. Kristen currently offers a handful of her designs on natural linen fabric in colors like fig, bluegrass and charcoal. 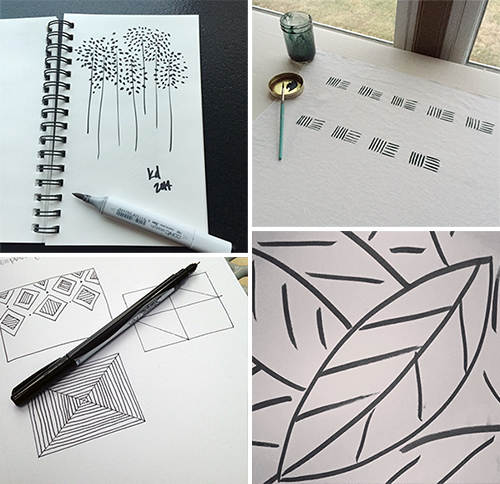 Kristen, "My latest series is all about organic lines and how they interplay. I've gathered many sketches over the past months and am now bringing them out of my sketchbook and into life using block prints, screen prints and hand painting on natural fibers." I love following artists like Kristen on Instagram because you get to see those sketches in progress and a bit of their process. Kristen, "I never leave home without my sketchbook- you just never know when inspiration might strike." Peruse Kristen's entire shop, here.